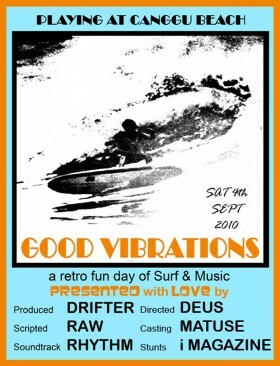 Deus Ex Machina, RAW, Drifter, Rhythm, Matuse and ‘i’ Magazine are proud to present the first annual ‘Good Vibrations’ Surf and Music day taking place in Canggu on September 4th. The event will be a fun fueled day of great music and great surfing featuring pre 1982 twin or single fin surfboards. The board can be old or new as long as it’s shape embodies the essence of yesteryear. There will be more than a few cool prizes being dished out, so if you think your the kinda guy(or girl) who has what it takes to take this compition by storm, put down your latte, get off your couch and sign up! ‘Old Man’s’ is the wave, classic boards are the ride and anything 60’s 70’s 80’s is the dress code. So dig your florescent pink and green boardies out, you know the ones im talking about. the ones that come six inches above your knee and you look fantasic in them. Award ceremony and after party will be taking place at the Deus Temple of Enthusiasm, followed by the opening of ‘single fin’ at the Deus Gallery. So head on down for just a good ol’ day on the beach. Beer, Music and surfin’….cant argue with that.